The RF Budget Analyzer app analyzes the gain, noise figure, and nonlinearity of a proposed RF system architecture. Build a cascade of RF elements. Calculate the per-stage and cascade output power, gain, noise figure, SNR, and IP3 (third-order intercept) of the system. Plot rfbudget results across bandwidth and from stage to stage. Plot S-parameters of RF System on a Smith chart and a Polar plot. Plot magnitude, phase and group delay of S-parameters of an RF System from stage to stage. 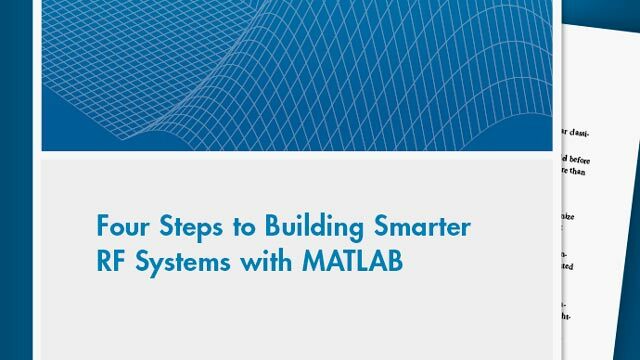 Export per-stage and cascade values to the MATLAB® workspace. Export the system design to RF Blockset™ for simulation. Export the system design to the RF Blockset Testbench as a DUT (device under test) subsystem and verify the results using simulation. MATLAB Tool strip: On the Apps tab, under Signal Processing and Communications, click the app icon. MATLAB command prompt: Enter rfBudgetAnalyzer. Design and analyze an RF transmitter using the RF Budget Analyzer app. Use the transmitter template to create a basic transmitter. Click the IF Amplifier in the design canvas. Delete it using the tool strip button. Save the system. The app saves the system in a MAT file. Plot the Output Power of the Transmitter analysis using the button. Design and analyze an RF receiver using the RF Budget Analyzer app. Use the receiver template to create a basic receiver. Click RF Filter in the design region. This block is an S-parameters block. It accepts a Touchstone File in the .s2p format. S2P file: Choose an S2P file by clicking the Browse. Name — PowerAmp2 | PowerAmp3 respectively. Plot the Output OIP3 of the Receiver .using the button. Create an amplifier with a gain of 4 dB. Create a modulator with an OIP3 of 13 dBm. Create an nport using passive.s2p. Create an rf element with a gain of 10 dB. Calculate the rf budget of a series of rf elements at an input frequency of 2.1 GHz, an available input power of -30 dB, and a bandwidth of 10 MHz. Show the analysis in the RF Budget Analyzer app. To plot the group delay, first plot the S11 data for the RF System. 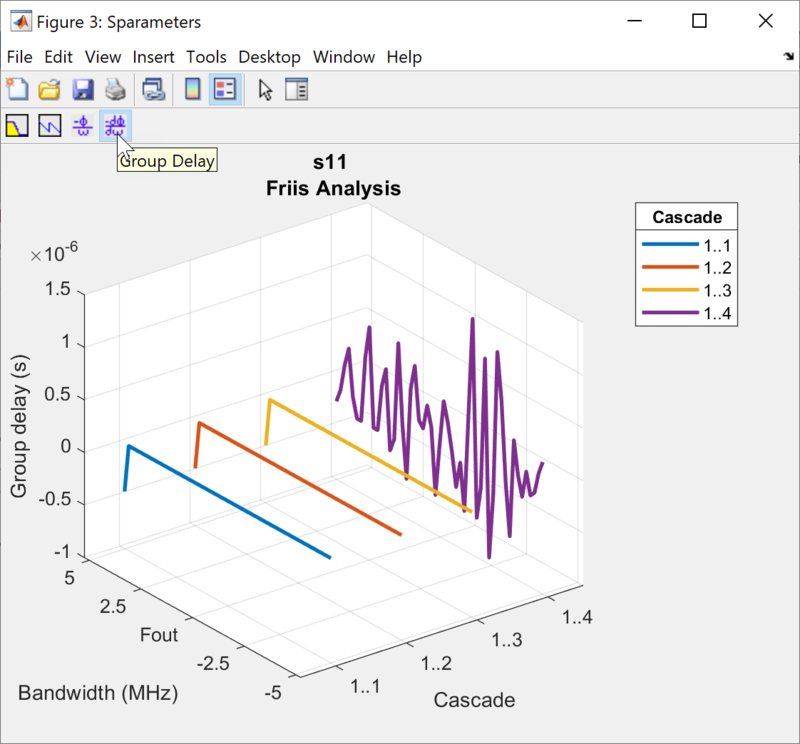 Use the Group Delay option on the plot graph to plot the group delay of the RF system. 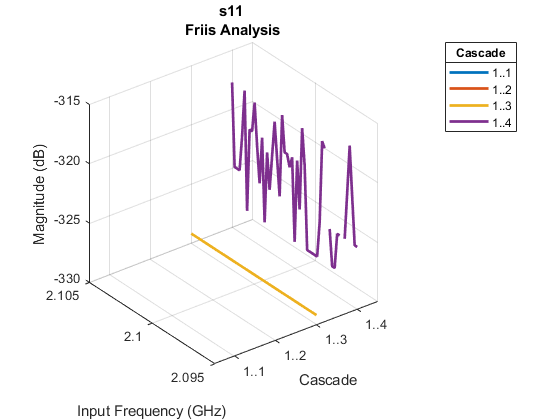 Use the Phase Delay option on the plot graph to plot the phase delay of the RF System. 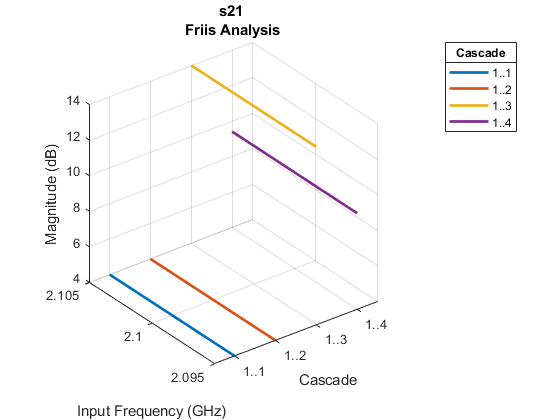 Carrier frequency of the RF system, specified as a scalar in: Hz, kHz, MHz, or GHz. RF Budget Analyzer accepts 0 Hz as input frequency of a system. Available input power to the RF system, specified as a scalar in dBm. Bandwidth of input signal, specified as a scalar in: Hz, kHz, MHz, or GHz. Name of the element added to the RF System, specified as a character vector. Touchstone data file, specified as a character vector, containing network parameter data. You can use only .s2p Touchstone files. Available power gain added of the element, specified as a scalar. Degradation of signal-to-noise ratio by the element, specified as a scalar in dB. Output third-order intercept of the element, specified as a scalar in dBm. Input impedance of the element, specified as a scalar in Ohm. Output impedance of the element, specified as a scalar in Ohm. Local oscillator frequency of Modulator element, specified as a scalar. Frequency units are the following: Hz, kHz, MHz, or GHz. This option is available when you choose the Modulator tool strip button. RF Budget Analyzer do not accept 0 Hz as input frequency for down conversion. Conversion type of Modulator element, specified as Up or Down. This option is available when you choose the Modulator tool strip button. Filter type, specified as Butterworth or Chebyshev. This option is available when you choose the Filter tool strip button. Filter response type, specified as Lowpass, Highpass, Bandpass, Bandstop. This option is available when you choose the Filter tool strip button. Filter architecture, specified as LC Tee, LC Pi, or Transfer function. This option is available when you choose the Filter tool strip button. Filter order, specified as a real finite non-negative integer. In a lowpass or highpass filter, the order specifies the number of lumped storage elements. In a bandpass or bandstop filter, the number of lumped storage elements is twice the value of the order. This option is available when you choose the Filter tool strip button. A scalar in hertz for lowpass and highpass filters. A two-element vector in hertz for bandpass or bandstop filters. By default, the values are 1e9 for lowpass filter, 2e9 for highpass filter, and [2e9 3e9] for bandpass and bandstop filters. This option is available when you choose the Filter tool strip button. By default, the values are 2e9 for lowpass filter, 1e9 for highpass filter, [1.5e9 3.5e9] for bandpass filters, and [2.1e9 2.9e9] bandstop filters. This option is available when you choose the Filter tool strip button. Passband attenuation, specified as a scalar in dB. For bandpass filters, this value is applied equally to both edges of the passband.This option is available when you choose the Filter tool strip button. Stopband attenuation, specified as a scalar in dB. For bandstop filters, this value is applied equally to both edges of the stopband. This option is available when you choose the Filter tool strip button. Use of filter order for filter design, specified as by checking the box. This option is available when you choose the Filter tool strip button. 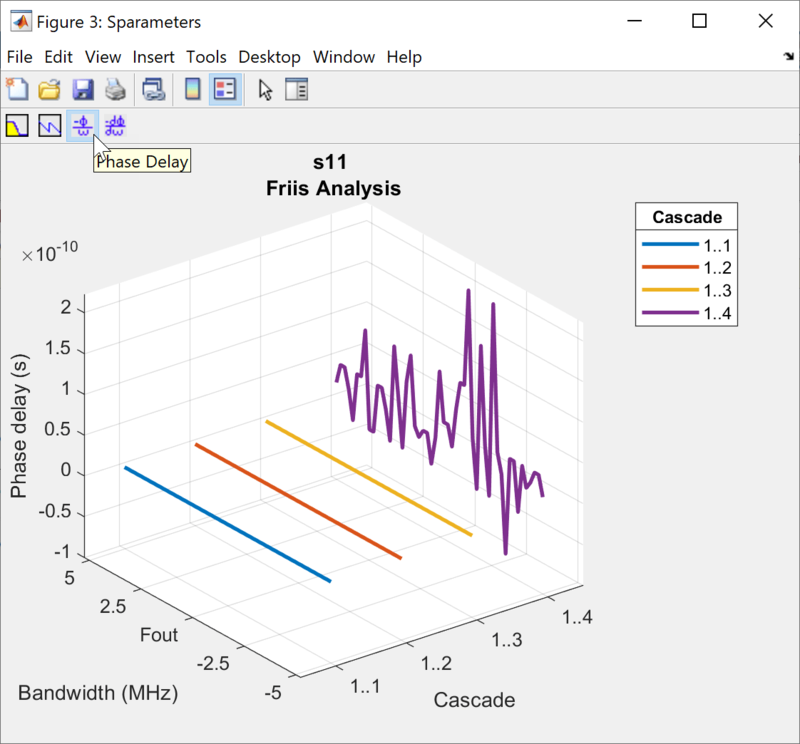 rfBudgetAnalyzer opens the RF Budget Analyzer app to analyze the per-stage and total gain, noise figure, and nonlinearity (IP3) of an RF system. rfBudgetAnalyzer(rfsystem) opens an RF system saved using the RF Budget Analyzer app. rfsystem is a MAT file.